Something vital has been lost in Catholic church architecture, obscuring any indication that God is truly present there. The sun was setting over the vast Valley of Mexico as I climbed up to the flat roof of a building at the Montefalco Conference Center to do a painting. The shades of brilliant scarlet from the sunset to the west threw the distant mountain range into waves of blue. I was anxious to get set-up fast in order to capture this strange beauty before it vanished. I wanted, especially, to capture at sunset the snow-capped Mt. Popocatepetl, (elevation: 17,887 ft.). Unfortunately, it was enshrouded in clouds. I fumbled to get everything ready. The eerie silence was broken only by the faint distant sounds of a mariachi band. A breeze came up. The sky darkened. I thought I had missed my chance. Then, all of a sudden, I looked up and saw, high above the hills to the north, the majestic snow-covered peak of Mt. Popocatepetl, emerging slowly from behind the lavender clouds, completely dwarfing the western mountains. Brilliantly illuminated in pale pink, the peak appeared like some ancient god towering above the lesser mountains in its distant majesty. No wonder the pagans worshipped this mountain! Its very silence seemed to say that it had been there, hidden all the time, towering above our little, mundane world—watching, waiting, and suddenly deigning to show itself in its own good time to those whom it chose. It was awesome. I threw my brushes down in dismay. My poor abilities could never, even for a second, capture that silent, terrible splendor. Is it any wonder that the natives worshipped this mountain? They may have been ignorant of Christianity, but they respected what they could see of the Creator in his works. At least, they had a “sense of the sacred,” something which seems to be lost today in many Catholic churches. Normally, we go to church to worship him, to participate in the liturgy. We go there not only for Holy Mass, but to confess our sins in the Sacrament of Reconciliation, to be baptized, to get married, and for our funeral Masses. These are the most private, personal acts a person can perform throughout his life. But even when there’s no liturgy going on, we go there to pray before his living Presence in the tabernacle. And, yet, today when you walk into many Catholic churches, they look like huge, cold auditoriums, warehouses, shopping malls or circus fun houses. Some are just confusing in their “modern” contortions. Where is the sacrifice? There is no apparent indication of sacrifice but only comfort and provision for every human convenience. And worship? There is no sign of reverence in that bland, antiseptic atmosphere. And God’s Presence? Just try to find the tabernacle. It is usually hidden out of sight behind a column, and given little more importance than a plaster statue. It is difficult to find anything of awe and reverence that would give any indication that God himself is truly present. Certainly, something vital has been lost in Catholic church architecture today, so much so that many of the faithful wonder, “What happened to the glory?” Hand-in-hand with the loss of the sacred is the loss of the sense of beauty. So many new and renovated churches are just plain ugly and barren. Some border on the grotesque. It is not a question of style. What has been lost is not a classical or gothic architectural style, but a total vision of the church edifice as a sacred space infused with beauty. But before considering “sacred space,” perhaps we Americans don’t appreciate any special place, much less “sacred” places. Possibly, we live in such an immensely large country with so much space that we have lost the sense of the uniqueness of any one place. Historically, we have always been moving westward. On the other hand, we all reverence the sites of Civil War battlefields. We sense the special significance of Plymouth Rock, or of Independence Hall, or “Ground Zero.” We like to return to the places of our childhood. So, perhaps, the loss of unique space is not really totally lost but hidden somewhere, deep down inside all of us. However, there are indications that this loss of the sense of special places can be more harmful than we think. Edward T. Oakes in an essay, The Apologetics of Beauty, recalled the massacre at Littleton’s Columbine High School on April 20, 1999. After the event, one native of Littleton wrote an essay describing how the town had changed from the quiet village of his childhood, into just part of the suburban sprawl of Denver. I grew up, however humbly, in a town with a character and sense of place, and I had those things, too. What sense of place can there be in the Littletons of America now, in these mall-lands: where each Gap and McDonalds is like the next, where the differences between things are neither prized nor scorned, but are simply wiped from existence? Growing up in an anonymous landscape, how can anyone escape his own encroaching sense of anonymity? In this world, meaning evaporates. In a world of monotonous getting and spending, the need to shake things up, to make a mark, any mark, may overpower everything else, including sense. The trench coat Mafia’s particular brand of evil may have stemmed from a terrible absence, a loss of perspective, that might be one of the unforeseen consequences of the loss of place. Long before Christianity arrived, mankind had reverenced certain places in nature as sacred. Mt. Fuji in Japan is sacred to the Shintoists, who must make a pilgrimage to its peak at least once before they die. There are groves sacred to the early Druids, as can be seen at Stonehenge. There are people in the Far East who make a festival of going to some vantage point to simply watch the sunset! Even people who have no religion occasionally have a “spiritual” experience when they walk through California’s redwoods, or peer into the Grand Canyon at sunset. St. Paul chastises those who ignore the Creator in his creation: “The wrath of God is revealed from heaven against the irreligious and perverse spirit of men, who, in this perversity of theirs, hinder the truth. In fact, whatever can be known about God is clear to them; he himself made it so. Since the creation of the world, invisible realities, God’s eternal power and divinity, have become visible, recognized through the things he has made. Therefore, these men are inexcusable” (Rom 1:18-20). The Lord gave Moses very detailed instructions concerning the dignity to be accorded divine worship. He laid down specifications for the construction of the tabernacle, the Ark of the Covenant, and the altar. He gave Moses guidelines for sacred utensils and priestly vestments. God wanted to give his people a profound respect for the sacred. Jesus Christ underlined this teaching with a new spirit. His zeal for the house of God is fundamental to the Good News. the utility of the wheel depends. that the utility of the vessel depends. nothing that the utility of the house depends. We should recognize the utility of what is not. Space constantly encompasses our being. the fragrance of a flower garden in bloom. totally on its boundaries as defined by elements of form. Architecture is also mute. Others make words to describe it, to study it. Words are even needed to build it. But once built, it simply is. Gilson states: “Architecture does not speak. IT IS. It is developed in a great silence, but man, being a talker, strains his ingenuity to make it speak.” This silence is most apparent when architecture is used to serve the Church. It should be silent. It is not supposed to call attention to itself because it is not at the heart of worship. The liturgy is the heart of worship. Architecture plays only an auxiliary role. It is the setting. It provides the space for the sacred actions of the liturgy, and, in so doing, becomes “sacred.” Although its role is auxiliary, it is extremely important because it has the ability to help or detract, to contribute or mitigate against the liturgy itself. Pope Benedict XVI has written that: “Here it is fitting to remember that the purpose of sacred architecture is to offer the church a fitting space for the celebration of the mysteries of faith, especially the Eucharist” (Sacramentum Caritatis). Certainly, it cannot play its part properly unless it somehow shares in the great religious mysteries it expresses and serves. There is nothing more sacred than the liturgy of the Holy Mass and the Real Presence of Our Lord in the tabernacle. Furthermore, it is challenged to somehow incarnate God’s glory with a glimpse of heaven. Man “strains his ingenuity” to incarnate that vision in a human way. This striving is always intrinsic to the nature of the architectural design process. Architects are always striving to incarnate some kind of vision: whether it’s Mrs. Jones’s vision of her new kitchen, or a mayor’s vision of the new city hall. It encompasses the real tension that is found in any creative effort. In sacred space, it happens to be God’s vision; or put the other way around, it is the believers’ vision of God in his effort “to capture the Unseen in the materiality of the Seen,”…silently. But along with the loss of the sense of the uniqueness of any space—much less, sacred space—we have lost the sense of beauty; and that might be the connection. As the Austrian poet, Rainier Maria Rilke, stated: “For the beautiful is nothing but the first degree of the terrible.” Beauty is a powerful thing. It must be the primary goal of sacred architecture. Pope Benedict XVI suggests that: “Beauty, then, is an attribute of God himself and his revelation. The profound connection between beauty and liturgy should make us attentive to every work of art placed at the service of the celebration” (Sacramentum Caritatis). To fail to produce beauty in sacred art is to rob God of His glory. The building structure may be in place, the creature comforts may be in abundance—including air conditioning, padded pews, the latest technology may be there, together with plenty of parking spaces—but God’s glory is not. It’s within this great sacrament that the sacred and beauty come together.Certainly, an important element of sacred art is church architecture, which should highlight the unity of the furnishings of the sanctuary, such as: the altar, the crucifix, the tabernacle, the ambo and the celebrant’s chair. Here, it is important to remember that the purpose of sacred architecture is to offer the Church a fitting space for the celebration of the mysteries of faith, especially the Eucharist. 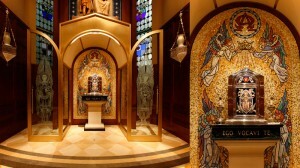 The photo accompanying this article shows the tabernacle and sanctuary in the Chapel at the Heights School in Potomac, Maryland, which was designed by Mr. Hardinge Menzies in 2008. Great hook, and I approve of any essay that quotes Rilke.